When it comes time to sell your home, you want potential buyers to see it as an open space and a blank canvas on which they can paint the story of their own life. That’s a little harder to do if a seller’s pack-rat tendencies show up on every shelf and in every closet. 1.) Designate time. Whether you declare a clutter war weekend or just 15 minutes a day, every little bit adds up and can make the daunting task a little less overwhelming. Whether you call in reinforcements or not, knowing 6:30-7:30 is cleanup time makes it hard to avoid. 2.) Make a list. If you have specific tasks to accomplish — the guest closet, the office or the entire upstairs — a list makes each more attainable. It will also keep you motivated. Who doesn’t love crossing something off their to-do list? 3.) Start in one spot. Before you move to attacking the kitchen, go ahead and finish cleaning out your closet. When you don’t have to worry about other lingering tasks, it’s easier to focus. 4.) Take it one bag at a time. When it comes to leaving too much junk around, take one trash bag through the room rather than an entire box. You’ll be surprised how quickly you can fill one bag to donate or designate for the dump. If your bags add up too quickly, consider calling a thrift store that offers pick-up. 5.) Give away slowly. Some items hold much more sentimental value than others. Once all the non-essentials are out of the house — broken toys, junk, useless gadgets — move forward with the more emotional pieces. Take them one at a time and consider what they really mean to you, but also consider how happy it would make someone else. It feels good to give! 6.) Designate a plan. Now that you’ve put in the work and decluttered your house, why would you ever want to go back? Toys should have a designated bin, shoes go in a certain spot and important mail gets sorted right away. 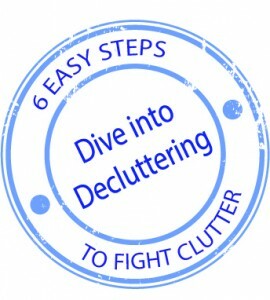 Put a plan in place for controlling the clutter in the future so you don’t have to start back at step 1! Though clearing a bit of clutter makes a home more likely to sell, it can also bring a bit of peace of mind to anyone who just wants a fresh start. Cheers to a clutter-free home!